Definition at line 133 of file util-var.c. References next, SCMalloc, strlcpy(), TAILQ_FOREACH, TAILQ_INSERT_TAIL, unlikely, and ResolvedVariable_::var_name. Referenced by DetectAddressParseString(), and DetectPortListsAreEqual(). Definition at line 162 of file util-var.c. References next, SCFree, TAILQ_FIRST, and TAILQ_REMOVE. Referenced by DetectAddressTestConfVars(), and DetectPortTestConfVars(). Definition at line 92 of file util-var.c. Referenced by FlowVarAddIdValue(), FlowVarAddIntNoLock(), FlowVarAddKeyValue(), HostBitsTimedoutCheck(), and IPPairBitsTimedoutCheck(). Definition at line 47 of file util-var.c. 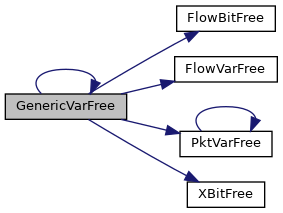 References DETECT_FLOWBITS, DETECT_FLOWVAR, DETECT_PKTVAR, DETECT_XBITS, FlowBitFree(), FlowVarFree(), GenericVarFree(), GenericVar_::next, PktVarFree(), SCLogDebug, GenericVar_::type, and XBitFree(). Referenced by DetectHostbitFree(), FlowBitFree(), GenericVarFree(), and SigMatchSignaturesGetSgh(). Definition at line 111 of file util-var.c. Referenced by HostBitsTimedoutCheck(), and IPPairBitsTimedoutCheck(). Definition at line 39 of file util-var.c. Referenced by GenericVarFree(), HostBitsTimedoutCheck(), and IPPairBitsTimedoutCheck().